Today, the United Nations Interim Force in Lebanon (UNIFIL) marked the 41st anniversary of its establishment with a ceremony at its Headquarters in Naqoura. This was to highlight the commitment of the international community and the United Nations to the Lebanese state and its people in providing a safe and calm environment for the local population in southern Lebanon. In attendance at the ceremony were representatives of the LAF and other security agencies, local authorities, mayors and religious leaders. Major General Del Col and Brigadier-General Roger Helou (representing the LAF Commander) laid wreaths at the UNIFIL cenotaph paying tribute to the memory of the UN peacekeepers from around the world who, since UNIFIL’s establishment in 1978, have given their lives in the cause of peace in southern Lebanon. During the proceedings UNIFIL leadership and LAF representative awarded 50 military staff officers with the UN Medal for their contribution to fulfilling the Mission’s mandate. In addressing the ceremony, the UNIFIL Force Commander highlighted the Missions continued presence in south Lebanon as a clear demonstration of the UN’s commitment and enduring support to Lebanon and its people. 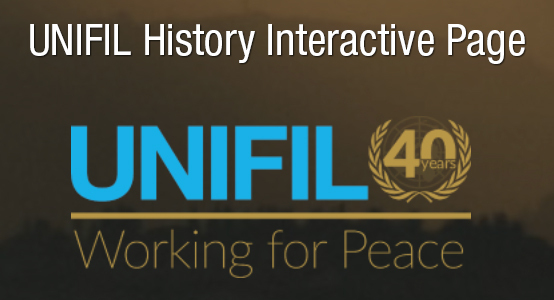 UNIFIL was created by the UN Security Council resolutions 425 and 426 of 19 March 1978, to confirm Israeli withdrawal from Lebanon, restore international peace and security and assist the Lebanese Government in restoring its effective authority in the area. Following the July/August conflict in 2006, the Security Council, through its resolution 1701, significantly enhanced UNIFIL’s mandate and capacity and assigned it additional tasks working closely with LAF in Southern Lebanon. Today, UNIFIL comprises almost 10,500 military personnel from 42 countries, including the Maritime Task Force, the only naval force in peacekeeping operations - and some 1,000 civilian national and international staff.